Mid and East Antrim Borough Council and representatives of Larne FC are set to enter into formal contract talks regarding the sale of Inver Park. Elected Members on the Council agreed on Monday night to proceed with the disposal of the ground, two months after it was listed on the open market. Formal negotiations will now begin between Council and the Larne Football Club (NI) Charity. Councillor Mark McKinty, who last night proposed to proceed with the sale talks, said the transfer of ownership of Inver Park was set to be a “fantastic result for Larne FC and Mid and East Antrim”. 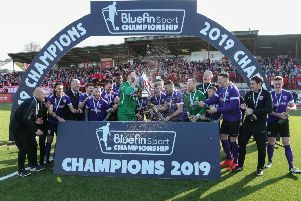 He said: “I am delighted with this development, which is good news for the football club, its fans, the people of Larne and all the citizens of Mid and East Antrim. “At last night’s council meeting, and after confirmation that grounds are protected for recreational use, I was pleased to propose that Inver Park be sold for stadium development - with the added amendment that some of the proceeds go towards some work at the war memorial, given the historic links with the Royal British Legion. Any final deal will be subject to all the terms within the conditions of sale being adhered to and legal contracts being finalised. The purchase of Inver Park is also subject to a covenant prohibiting the use of the land and structures for anything other than sports or recreational purposes. Councillor Gregg McKeen, who seconded the proposal, added: “The successful bidder has set out exciting and ambitious plans for the venue, which I have no doubt will ensure a fantastic future for Larne FC and the local community. Larne FC owner Kenny Bruce said: “We are delighted that our charity’s offer to purchase Inver Park has been accepted by the Mid and East Antrim local authority. “We have been very impressed by the support we have received from the local authority for our project to create first-class sports facilities at Inver Park for the Larne people. “We have a charity set up to purchase Inver Park and the trustees will hold that asset for the Larne people so that it remains a centre for sporting excellence for hundreds of years to come. “We hope to conclude the transaction as soon as possible so we can complete the works on a new 4G playing surface and floodlights for the start of 2018-2019 season. In January, Elected Members were provided with a number of options in relation to the proposed development of Inver Park. They agreed to proceed with the sale of the venue in line with legal and procurement advice, with guidance provided by the NI Audit Office. Following procurement, audit and legal advice, a negotiated disposal process was proposed. The lands were subsequently offered on the open market. Offers received were evaluated against the conditions of sale and negotiated process was entered into to ensure best value was obtained for Council and its citizens. The lands under offer extend to a total of 4.7 acres.